As you age, daily activities may become more difficult or impossible to complete independently. For example, arthritis in your hands can make opening tight jars painful. A broken elbow might limit your ability to reach for and grasp items. A stroke affecting your ability to move one side of your body can make manipulating buttons or zippers a daunting task. Fortunately, there are tools designed to help you with these activities. Assistive technology, or adaptive equipment, is any item, piece of equipment or product system that is used to increase, maintain or improve the functional capabilities of older adults as well as people with disabilities. So important has assistive technology become that March 27 has officially been designated National Assistive Technology Awareness Day by the 116th United States Congress. The Centers for Disease Control and Prevention (CDC) has reported that, among adults 65 years of age and older, two in five have a disability. The most prevalent disability types for older adults are hearing, mobility and independent living disabilities. People can use assistive technology — which includes both high-tech and low-tech devices — to assist them being more independent, whether that’s in the community, workplace, classroom or at home. Examples of low-tech options include items like ergonomic jar and bottle openers, reachers, built-up handles and button/zipper hooks. Mid-tech equipment refers to devices that may require batteries or a circuit, like battery-operated magnifiers or adapted keyboards. High-tech equipment refers to more complex systems that often require skilled training to master, such as power wheelchairs and communication devices. Depending on your limitations and needs, you may require different kinds of assistive technology in activities of daily living (ADL) and instrumental activities of daily living (IADLs). 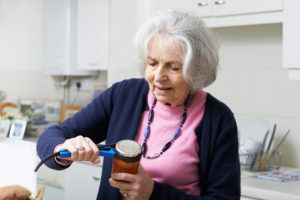 ADLs are activities oriented toward taking care of one’s own body, while IADLs are activities that support daily life within the home and community. Examples of ADLs include bathing, toileting and dressing, and IADLs include driving and community mobility, meal preparation and shopping. New York State, through a federal grant from the U.S. Department of Health and Human Services Administration for Community Living (ACL), also administers the Technology-Related Assistance for Individuals with Disabilities (TRAID) Program. The TRAID Program’s mission is to coordinate statewide activities to increase access to and acquisition of assistive technology. The Hudson Valley’s Regional TRAID Center’s website is: www.cpulster.org/services/traid-program. For more information about occupational therapy, please see: https://www.aota.org. MOTION occupational therapists provide individualized assessments for AT on a daily basis, using both low-tech and high-tech devices during treatment to help our clients meet their goals and get back to what moves them. To find a MOTION location near you and request an appointment with an occupational therapist, visit https://motionptg.com.